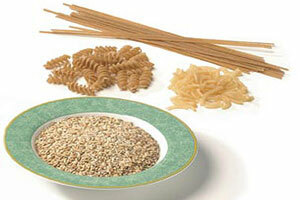 There are two types of Dietary fiber soluble and insoluble. Soluble fiber dissolves in water. In the blood, soluble fiber helps to lower serum cholesterol by binding with low-density lipoproteins. Water-soluble fiber can be found in apples, oranges, oat bran and beans. Insoluble fiber is the substance in food that cannot be digested or absorbed by the intestine. This category includes pectin, cellulose, hemicellulose and gums. Fiber is found only in plant foods such as fruits, vegetables, nuts and whole grains. Eggs, dairy products, and meats do not contain any form of fiber. Studies found that cultures that have a high fiber diet have a much lower incidence of diverticulosis, which affects 30 million Americans. A weakening in the large intestinal wall caused by the pressure from hard feces produces this disease. The American Journal of Digestive Disorders reported that 85% of diverticulosis sufferers were successfully treated with a high-fiber diet. Fiber cleans out mucus from the intestinal tract and lowers cholesterol. Fiber decreases the transit time through the intestine. Cancer of the colon can be attributed to a lack of dietary fiber. Animal products do not have any fiber so their passage through the intestine is slow. The proteins ferment and allow harmful bacteria to multiply within the colon. The harmful bacteria secrete carcinogenic waste as a by-product that damages the intestine. Nutritionists recommend a salad with a meal high in meat or dairy products. The fiber in vegetables slows down fermentation and neutralizes some of the toxins in the bowel. It is important to break a fast with fruits and vegetables. Their high fiber content acts like a cleaning sponge within the intestine. Although fiber is important for a healthy diet and a clean colon, during fasting, fiber slows down the healing process. It causes the digestive system to work. If you eat five pounds of raw carrots rather than drink the juice, your body will have to do the work of extracting nutrients and moving the fiber by peristalsis. Allowing the digestive system to rest is essential in healing. For this reason, juice fasts are more effective in healing when the intestine is empty of fiber. During a juice fast, it is best to use a strainer to filter the pulp from vegetable and fruit juices. The process of discharging toxic waste is accelerated during a fast, especially during water or restricted juice fasting. Regular bowel movements are disrupted because of lack of fiber. Therefore the toxic waste discharged into the intestine ferments and can be reabsorbed into the bloodstream causing a cleansing crisis or general irritation.